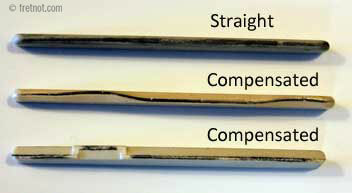 The first step to correcting your instrument's intonation is to address any issues that can cause intonation problems. If you haven't done so already take a look at my list, most new intonation problems will be caused by one of these issues. Knowing the cause is the first step to fixing the problem. If notes played at the 12th fret are dramatically sharp or flat, changes to the strings length and position of the saddle (or shape of it's crown) may be necessary. When correcting poor intonation on an acoustic guitar I use an electronic tuner to evaluate the strings tuning at the 12th fret. I record this information for reference while making adjustments. Only after any issues that can contribute to poor intonation are corrected do I may further adjustments to the nut and/or saddle. Installing a pre-made drop in compensated saddle is usually a simple upgrade. If your instrument has already been set up properly you can use your original saddle as a reference when sanding the height of the new one. If the instrument has any playability issues a set up should be performed along with the saddle upgrade. Most saddles are either 3/32" or 1/8" wide. When purchasing a replacement, height can be filed by sanding. Graph-Tech®, makers of Tusq® brand saddles, provide a large selection of pre-made compensated saddles. See assortment in right sidebar. When pre-made saddles are not available thru retailers or from the original manufacturer the saddle must be made from scratch. In these instances a saddle blank is used and shaped to fit. to alter the individual string length and adjust intonation. For instruments in need of extra fine tuning the shape of the compensated crown may need to be filed by hand, adjusting the length for each string individually. This is a more costly, time consuming method which may be required when good intonation can not be achieved using a pre-made saddle. Fretting a string stretches it and stretching a string will sharpen it slightly. To offset this sharpening, length is added to the instrument's scale length to compensate. However, lengthening the string to compensate for fretted notes also lengthens the open string. Compensation of the nut can be achieved in different ways. Most have settled on a "shelf system" whereby the nut overhangs the end of the fingerboard which renders it slightly shorter. 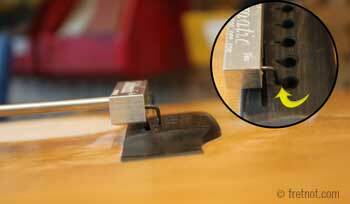 This eliminates the need to permanently modify the fingerboard's length by cutting it. Earvana® is one example of a prefabricated compensated nut. The Buzz Feiten Tuning system® is another method. 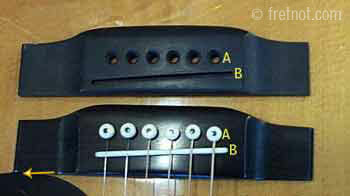 Modifications are made to the position of the nut or fingerboard length. Intonation is then adjusted according to slightly offset tunings which are determined by string gauge, scale length and action. My advice is to try the self-nut first, before modifying the fingerboard's length. I find it difficult to justify shortening the fingerboard of a vintage or valuable instrument. Just as there are several theories about ideal saddle and nut compensation, there are also different ways which we can tune our instrument. One of the most popular methods is to use a chromatic instrument tuner to tune the open (un-fretted) strings. Other methods include using harmonics to tune or tuning 2 particular chords until they are in tune with one another. You can use whatever method you feel pleases your ear. Some instruments suffer from poor intonation because the bridge and/or it's saddle slot is not located properly. It is either too close to the fingerboard causing sharp intonation, or too far, causing flat intonation. This instrument played terribly sharp due to a misplaced bridge. The yellow arrow reveals the correct location for saddle placement. When possible (and appropriate), the original slot is filled and re-routed to correct the problem. 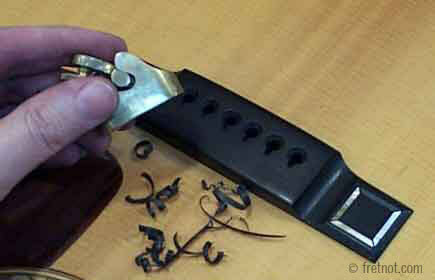 Ebony was used to fill the original saddle slot prior to reslotting. to avoid placing the saddle too close to the bridge pins. A bridge slotting jig serves as a guide for my laminate trimmer. On the bridge below, moving the saddle's position would have placed it too close to the bridge pin holes. Instead a new bridge was made. It is quite common to see this scenario on Martin guitars built in the 70's (though they are not the only example). Note the positions of the bridge pin holes and saddle slot. The top bridge is an original, the bottom is the replacement. Also of note is the proximity of pickguard to bridge. 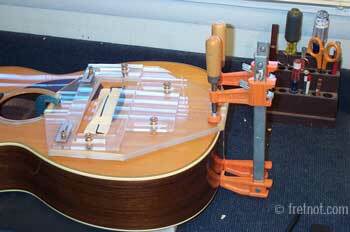 Physically moving an acoustic guitar bridge to correct the intonation would leave behind a nasty unfinished area on the top which would be easily noticeable even with touch up. The alterations I make allow the bridge to sit on the same "footprint" and are only noticeable to those well acquainted with the original design. Having every single note in perfect tune is beyond the abilities of many equal tempered instruments. There are in fact compromises and for a select few ...they may always be disappointed with the intonation of a fretted instrument. I have always found intonation to be far more frustrating on shorter scale instruments. Due to the shorter string length, slight issues have a more noticeable effect.